Like father, like son, right? We definitely think so, especially after seeing photos of David Beckham and his mini-me Brooklyn Beckham at the King Arthur premiere. 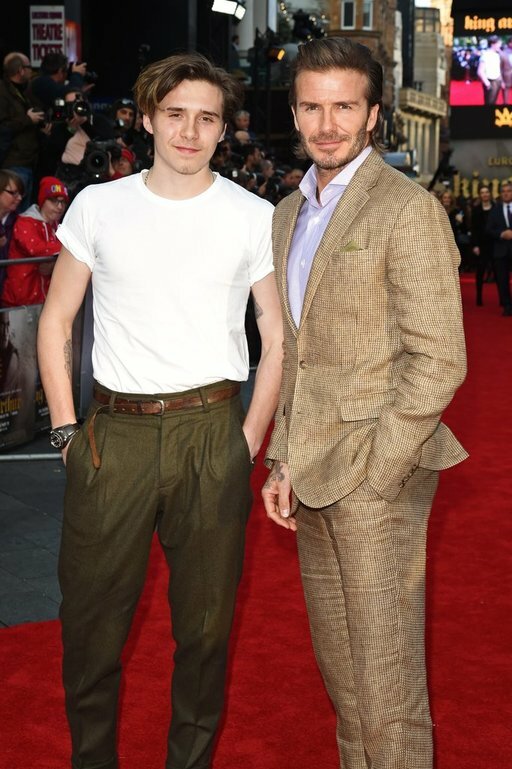 The handsome duo turned up the father-son bonding as they walked the red carpet to celebrate David’s acting debut at London’s Cineworld Empire on Wednesday night. The duo made quite the stylish pair. David looked dapper in a light brown suit while Brooklyn kept things a bit more casual — donning a plain white t-shirt and olive slacks. Unfortunately, the rest of the Beckham bunch didn’t make the event but from the looks of it, the two had an amazing time nonetheless. Of course, wife Victoria gave her husband a sweet shout-out on Instagram, writing, “So proud of @davidbeckham! @kingarthurmovie x VB #KingArthur,” alongside a clip of the movie. At the event, the twinning father-son pair were joined by David’s costar and the film’s leading man, Charlie Hunnam as well as director Guy Ritchie and his wife, Jacqui Ainsley. King Arthur: Legend of the Sword hits theaters on May 12th, and while we’re excited to see it, right now we’re kind of obsessing over just how much David and Brooklyn really do look alike. A quick trip down Instagram lane totally confirmed that Brooklyn is in fact his father’s mini-me. From the matching hats to the handsome smiles, we’re loving it all.